10-12 items that can be set up to be knocked down (bowling pins, pop tins filled with sand and taped closed…etc.). 2-4 “Bats” (Don’t use metal bats! ), Wooden rods, PVC piping taped shut at both ends…etc. Floor Tape (indoor) or sidewalk chalk (outdoor) to mark the playing areas. To explain the aim or Gorodki, one can view the game as something similar to bowling. 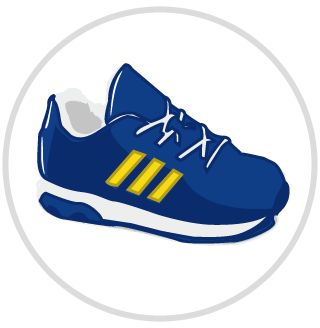 Instead of pins, there are gorodki, and in the place of a bowling ball, players throw bats at the gorodki. The gorodki are usually cylindrical wooden pins that are usually twenty centimeters in length and 4.5 centimeters in diameter. The bats that are thrown towards the gorodki are usually wooden rods, just under a meter in length and 3.5 centimeters in diameter. 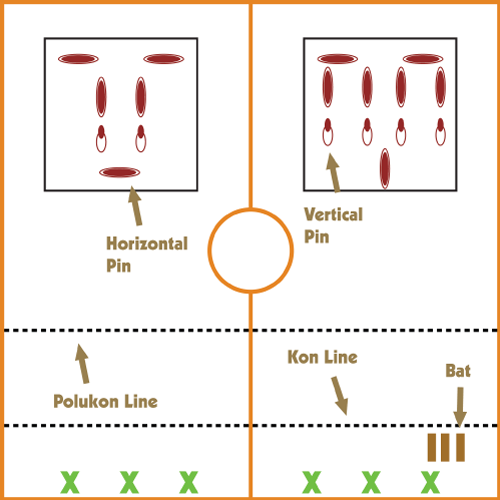 In bowling, the pins are placed upright, but in the sport of gorodki, the gorodki (pins) are arranged in various different forms and patterns. Gorodki is played on a marked out square, preferably on asphalt or gravel, and each square, which is two meters in size, is called the Gorod (city). In front of the Gorod is the Prigorod, or suburb, with the penalty line just before that. Thirteen meters away from the Gorod is the main throwing line known as the Kon, with the Polukon line being six and a half meters away from the Gorod. Teams playing against each other will either have their Gorods across from each other, or next to each other. There are usually fifteen patterns, or figures, that team members must try to knock out, by throwing their bats at the figures from the Kon (throwing line). Let your kids decide what patterns they would like to create and throw at, and have them make sure that they are able to make patterns that look like something (Some of the traditional patterns include a fork, arrow, cannon, crankshaft, racket, star, well, watchmen, airplane, sickle, letter and lobster). Once one of the Gorodki has been dislodged and moved outside the lines of the Gorod, players are permitted to move closer and throw from the Polukon to try and knock out the rest of the Gorodki. Whichever team can knock out all of the Gorodki in the fewest number of throws possible, wins that round. The team with the most points at the end of the game, wins!